﻿ How Physically Active Should I Be to Lose Weight? There is a very simple answer to this question: 3,500 burnt calories contribute to the loss of one pound. If your workout routine helps you burn off 300 calories, you will have to wait for some 12 workouts to pass until you reduce your weight with that one pound. If, on the other hand, you take in 300 calories less in addition to the 300 burnt, you will get rid of that pound twice as fast. Those who wish to reduce their weight ought to spend at least 200 minutes a week (this is over three hours) doing mild intensity exercise. When a person sticks to a pattern of regular training and minimum calories, this period can be brought down to 150 minutes a week (2 ½ hours). This doesn’t hold for beginners, though. 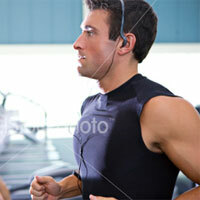 They are advised to start with 50 minutes of exercise a week and gradually increase them to 200. Dietitians always remind us that excess weight has not been amassed in the last couple of months, so we cannot possibly expect to magically lose it for a couple of months, too. Everybody wants the ideally sculpted body they have always dreamed of and they want it now. Nobody is willing to wait. The truth is, if you internalize this concept, you are never going to achieve it. You’d better get ready for some hard work and arm yourself with patience! 1.Find somebody to train with. Some experts in the field find this particularly important. They claim that having someone right by your side, even if that’s your dog, teaches you to be honest. What is more, you can more easily reject the idea of training when it comes straight from you, rather than from a friend or a close person. 2.Plan your training sessions in advance. You might as well try keeping a special calendar with exercise entries. When the date and time of your workout is already specified, you’ll have no excuse to skip it in the end. 3.Don’t neglect the scales. This is an excellent means of checking your progress. Regular weighing will enable you to make changes into your eating or training habits, so that your regime aims at obtaining the best results. 4.Take it easy. One of the worst things that can happen is to let your motivation totally overwhelm you. Lifting really heavy weights or doing aerobics six days a week is no good, contrary to common expectations. This can only lead to an injury that will ultimately make you give up training. 5.Track your weekly results. Keeping record of how many times and how long you exercise throughout the week will enable you to better chart the regime you have established. Looking back at your weekly successes and failures, you can decide how to improve your schedule to come closer to your final goal. 6.Prepare your meals at home. This is the only way to monitor the amount of food you consume and the number of calories you take in. Calories are typically fewer in homemade dishes. Leave restaurants for celebrations only. Next time your friends suggest going out for dinner, offer a walk instead. 7.Don’t replace the glasses of water with such of alcohol. Even if it is wine or beer, it gives you another hundred calories. The worst thing about alcohol, however, is that those few glasses make you unaware of the actual number of calories you take through food. Don’t get this wrong: you don’t have to totally abandon alcohol, just limit its overall amount. 8.Summon the whole of your willpower when asked at a party. All these types of cheese and crackers and appetizers are so tempting but before you realize it, you’ll be over 300 calories, not counting those from the dinner itself. Dietitians often speak of people’s inherent inclination to take advantage of food whenever they can and the absolute lack of such inclination when it comes to spontaneous training.